What a roller coaster of a year! Between a rough start in January when the S&P 500 was down 5% (the worst month since 2009), Brexit, the Trump election night crash and then end of year “Trump bump,” I don't think anyone foresaw that the market would be down and then WAY up by the end of the year. In 2016 our investments returned 10.7% and our net worth grew by 15.8%. Details on what worked for me and my wife below after a few thoughts on investing in 2016. While I followed most of the big news throughout the year, I did not change my asset allocation at all. I have quickly learned that whenever I or anyone else tries to outsmart the market, you lose pretty quickly. My response to the uncertainity: stick to the plan! Did I think Trump would win the election? No. Did I think the market would react so positively to his winning? No. Did I think the year would end with the markets up more than 10%? No. I thought the market would be down or flat in 2016. Do I think the market is overvalued now and due for a correction? YES! But I thought this last year as well. Am I changing my investment strategy based on this guess? No. Timing the market is a fools game. Time IN the market is what makes the average investor money. Check out the Shiller P/E ratio, which is the price earnings ratio is based on average inflation-adjusted earnings from the previous 10 years, known as the Cyclically Adjusted PE Ratio (CAPE Ratio), Shiller PE Ratio, or PE 10. As you can see, we're not quite in 2001, Dot-Com Bubble territory yet, but we are already above the 2008-2009 housing market collapse CDO, mortgage back securities area. If you are saving for financial independence or early retirement, a good -50% market correction can be great for your portfolio. You get to buy all of the best companies in the world on sale! If you are already retired or approaching FI, a bear market can delay your plans by a few years. Sequence of returns risk can be detrimental to early retirees. The first ten years of your retirement will pretty much dictate whether your assets will survive you or you will need to supplement the income slightly. Check out the MadFientist Safe Withdrawal Rate and GoCurryCracker Worst Retirement Ever articles for more details. Great writing with a lot of in depth math. I re-balance my portfolio in May of each year. No real reason for this other than it avoids the stock market mayhem of end of year selling, beginning of year exuberance, and summer doldrums. 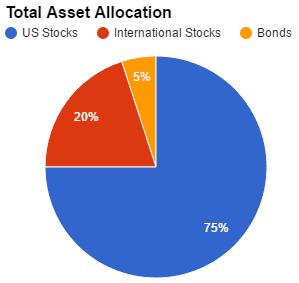 This year my asset allocation was 75% US stocks, 20% international shares, and 5% bonds, split evenly between government and corporate bonds. I discuss in more detail why I chose this asset allocation here. I plan to keep this asset allocation heading into 2017. I have been doing some more research on increasing my bond exposure due to the increased gains and reduction of volatility. Volatility does not worry me at the moment, but it may become more important as my wife and I approach financial independence. This year I turn 30, giving me ten more years to reach my goal of financial independence by age 40. We have passed $250,000 in net worth and should be able to save $1 million by age 40, giving us $40,000/year to live on. My current career goals are to continue working beyond age 40, but to work less days per month. I am finding as I get further along in my career that I enjoy my free time to cycle, run, lift, relax, and socialize more than I enjoy climbing the career ladder. 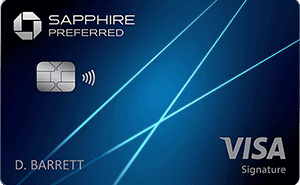 My assets are scattered across 6 Vanguard accounts, a TSP account, and a Betterment account. I keep track of all of them through Personal Capital, a free account aggregation tool that lets you look at performance, asset allocation, and run retirement models, all for free. If you sign up through my link, I may receive a commission, but it's free for you to sign up. I have been using PC since 2014 and it's still my “go-to” to look at all my accounts in one place. My Vanguard account includes my Roth and Traditional IRAs, my wife's Roth and Traditional IRAs, and my SEP (Simplified Employee Pension) IRA, which I contribute to from my website income, and a joint taxable brokerage investment account. You can see how we got slammed in January, as did nearly every other investor in the stock market. Many people panicked and pulled out their assets. They missed out on a major bull run for the year! It's even more impressive to look at the growth of our Vanguard assets since we started investing with them in 2013. While there was a big dip in late 2015, early 2016, the 2016 bull run added over $10,000 to our net worth. 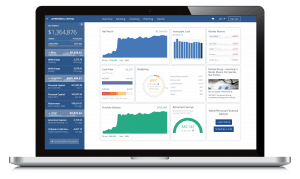 Betterment is known as a “robo-advisor.” You tell the software what your risk appetite is or what stock/bond ratio you want and the computer algorithm selects an investment portfolio for you out of 10 ETFs. Of course they charge a fee for this service, but it's quite small once you get above $10,000 in assets invested. Of course you can do it all yourself (DIY) and save a lot of money. You should never be paying an expense ratio more than 0.25% for any investment! I like to experiment with DIY vs. automated investments. 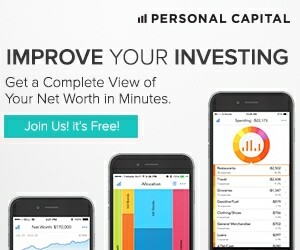 In 2016 my investments beat Betterment but only by 1 per cent. One year is not long enough for a data point, we will see who invested better after 40 years. My Betterment return for 2016 was 9.5%, as you can see below. Above you can see the chart comparing my Betterment account at 90% stocks, 10% bonds vs. the S&P 500. Warren Buffett is right when he says just leave it in the S&P 500 for most investors! My fancy computer selected portfolio couldn't beat the returns on the 500 largest companies in America. Again, one year is too short a time period for comparison, but it is interesting. With 10% bonds in my Betterment portfolio, that dragged down my returns this year. But in a bad year for stocks, the bonds should perform better. Yin and yang. I'm investing for the long run, so I don't sweat one years performance. My best performing account was the TSP. 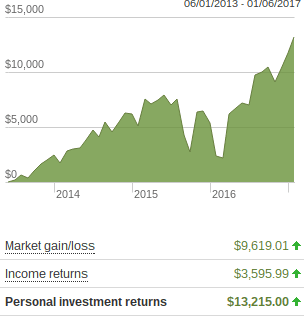 I have often preached the simplicity, automation, low costs, built in diversification, and tax advantages of the TSP, but in 2016 my TSP account delivered all that PLUS an 11.5% return! You can see how my asset allocation that I set in May 2016 (on the right) drifted a bit to what it was 31 Dec 2016 (on the left). This is due to the small cap stocks (S Fund) outperforming the G and F fund (which you would expect). 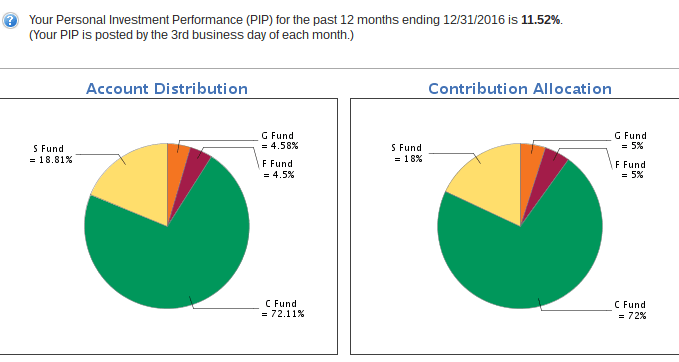 All of my investment accounts beat my benchmark, the Vanguard LifeStrategy Growth Fund, which is a 80% stocks (60% US, 40% international) and 20% bonds, which returned 8.33% for 2016. My asset allocation is working well. My principles of automation, diversification, simplicity, and low costs continue to reward me. So reader, how did your investments do in 2016? Did you beat your benchmark? Please share any lessons learned that we might all become better investors in 2017! Could you please email me on the GAL? I’m getting into private lending and would like to ask a few questions. Last name is Wahl, first initial E, and I’m at Mcchord AFB. I would greatly appreciate it! Your website is interesting and thoughtful, and I would like to humbly offer some thoughts. In your article, “2016 Year in Review,” you describe your investing experience as a “roller coaster” experience where your Vanguard performance was 10.25% and your TSP performance was 11.5%. Like you, I am a career military officer, an active and reserve O-6, and have a TSP (not because I like it, but because I am not allowed to pull it out and move it to a Self-Directed IRA until I separate upon retirement from the military). Personally, I do not like the “roller coaster” experience of stocks, which are paper assets that can lose half their value in a matter of days. In the military, I am a judge advocate (attorney). In the private sector, I am a business owner, a legal counsel for a gaming-hotel-hospitality group. In my investing, as in my military and private sector careers, I look for predictable strong growth with multiple levels of risk mitigation. In addition to investments in the TSP, I have for years dramatically grown my Roth IRA by setting it up as a Self-Directed Roth IRA and lending with double-digit fixed-rate annual returns with promissory notes backed by real estate. Further, my net worth has considerably grown through acquisition of single and small multi-family (two to four unit) rental properties (which is not that difficult to do with some due diligence and which does not have to involve having a lot of money as some think). From my own personal experience, and from my observations of my investing mentors, for the amount that you say you are saving annually, you would likely far exceed the goal of $40,000/year by age 40 if you allocated more to buy-and hold rental properties and if you invested as a private lender on real estate assets in a Self-Directed IRA. I’ve added that much passive income/positive cash flow in the last three years alone, and in addition to income and appreciation, it comes with benefits that stocks and mutual funds do not offer: tax depreciation which I write off against my income taxes, business expenses for my LLC holding company which I also write off against my taxes, and equity build-up as tenants pay off my long-term mortgage debt (which itself is a tax deduction). What percentage of allocation do you place on private lending on real estate assets? And if you do not do that, why not? I don’t see that mentioned in your allocation fo r2016. I’ve found, that year after year, in my Self-Directed Roth IRA, I get fixed annual returns that do not go up and do not go down but remain fixed rates of return, and those rates range between 12% to 16% depending on the promissory note and the underlying real property on which the note is secured. For example, for someone who is fairly conservative, yet would like a good solid return, a more conservative real estate debt fund (in which I am a lender with promissory note positions) which has short-term notes of 12 months, which mitigates risk as it is fairly diversified (buying, renovating and selling 30+ single family homes a year), which further mitigates risk to long-term market exposure (as each property is bought and sold with short holding periods ranging from 3 to 6 months), and where the fund operator has an extensive track record with 40-80% annual profit margins, pays me a fixed annual return of 12%. That beats the average of all TSP funds since inception, and it beats the S&P 500 20-year annual return, and it’s a conservative option backed by hard assets with real value. I welcome your thoughts. Again, I appreciate the thoughtful and well-developed website and wish you the best as you work to achieve all of the goals that you have set. Thanks for sharing- Its sound like I’m just a few months older than you, but only about 1/2 way to your status on the FIRE road. I appreciate you sharing real numbers- I’ve been struggling with how to demonstrate my families numbers without divulging too much financial information or coming across as insensitive, and I think you hit the nail on the head. I also love your play on word- Time IN the Market. c) why not hold your international funds, if any, in a brokerage account to take advantage of the tax deductions? Personal Capital is constantly harping on me to add to my seriously underweight International portfolio, and while i hold a few share of VXUS in my IRA, I’m still giving thought to what i want do this year and moving forward. I’m happy to say as an enlisted Airman (also turning 30 this year) that I’m right on your tail. We cracked $200k net worth thanks to a big December and maxed my traditional TSP for the first time in 2016. This year is a PCS year so hopefully my expenses don’t skyrocket, especially since the wife will be unemployed for a couple of months. Brandon, that’s awesome! We’ll both be half-millionaires pretty soon! Congrats on maxing the Traditional TSP and keep it up this year! PCS can be a stressful time, so make sure you have some money set aside for expenses, even if you will be eventually reimbursed. We have a PCS coming up as well. Last PCS we made several thousand dollars when it was all said and done, but it took several months to get all the payments due to us. I am not expecting to pocket as much as this next PCS, but we will do what we can to keep expenses and stress levels low.